Driven by a strong customer demand, and an explosive increase in cloud workloads, Dell EMC is well-poised for the growth of cloud-ready data protection and recovery needs of customers. Data Protection as-a-Service (DPaaS) is a core requirement customers have when selecting a cloud service provider. However, until now, there have been no native solutions to address this need with existing solutions requiring a separate tenant portal or additional user interfaces, making the process more complicated for both cloud service providers and, most importantly, their customers. Announced at VMworld 2018, VMware and Dell EMC have partnered to deliver tenant self-service DPaaS for VCPP partners leveraging VMware’s vCloud Director (vCD) platform. 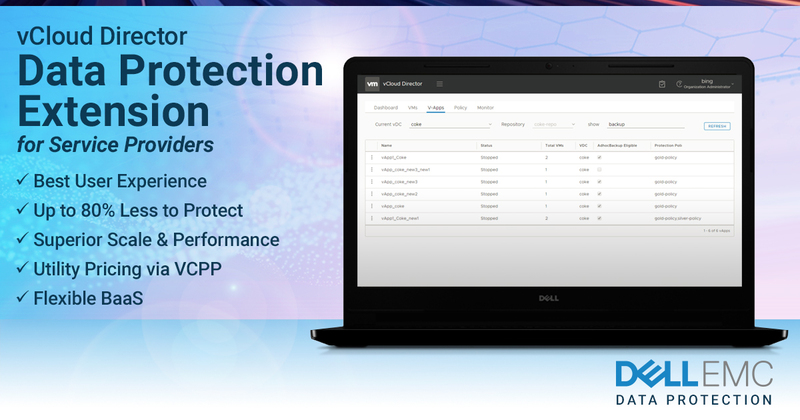 vCloud Director Data Protection is available directly within the vCD tenant portal UI, eliminating the need for tenants to access a separate user interface specific to Data Protection. For tenants or cloud providers interested in orchestrating via APIs, all Data Protection capabilities are also integrated directly into vCloud Director’s REST API, via extensions. Dell EMC’s complete software solution for protecting VMware workloads, consisting of Avamar with Dell EMC Data Domain, can easily be managed by Cloud Providers. Now cloud service providers with multi-tenant VMware environments can offer their customers robust, integrated data protection with a best-in-class user experience. Plus, service providers and their customers benefit from Dell EMC Data Protection’s proven low operating cost, high scalability and performance. Best user experience: Dell EMC is the only vendor that provides data protection fully integrated into VMware vCloud Director – competitors require a separate tenant portal and often require service user accounts to be created within the vCloud environment. Flexible BaaS: Flexible backup options enable backups to be run automatically through policies and/or on-demand. Self-service restores can be executed by tenants at the vApp-level, the VM-level, and even the individual file level. The data protection vCloud Director extension from Dell EMC recently helped Telefonica widen its cloud service offerings to Data Protection as a Service (DPaaS) and strengthen their support for customers in their journey to the cloud when choosing them as their Cloud Provider. Known as a carrier that provides Mobile, Broadband Internet access, TV and corporate connectivity, Telefonica is also a Tier-1 Cloud Service Provider. Telefonica Business Solutions manages globally the Enterprise, Multinational and Wholesale (including Roaming) businesses within the Telefonica Group. This organization relies heavily on a cloud-first strategy to support their customers in their digital transformation process, providing more than just core solutions – but also solutions such as Cloud, Big Data, Security and IOT. 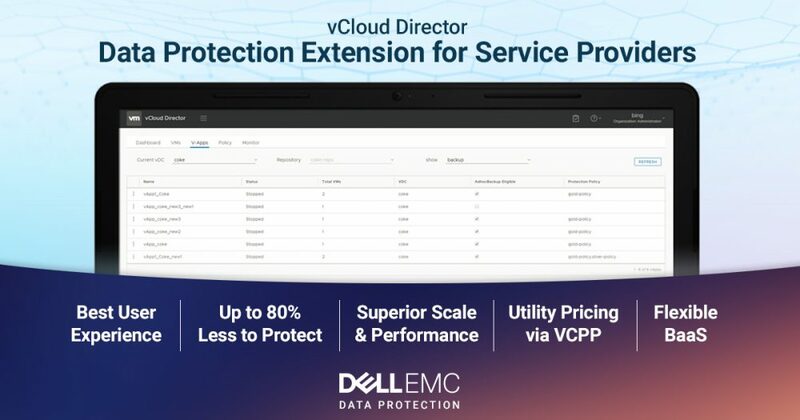 Telefonica now allows customers to utilize Dell EMC data protection in a DPaaS consumption model integrated into their new virtual data center offering – VDC 4.0. This new service puts control of data protection in the hands of Telefonica’s customers, eliminating the need for them to file tickets in order to initiate restores, as an example. Now Telefonica can offer their customers robust data protection as a service with a superior user experience while at the same time minimizing their cost-to-serve. This blog is co-authored by Sandro Bertelli, a Global Product Manager at Telefonica.